The International Space Apps Challenge takes place from April 20-21, 2013. NASA is kicking off a worldwide hackathon this weekend, with teams of citizens competing to create software, hardware and mobile and web applications that will solve problems and improve life on Earth and in space. 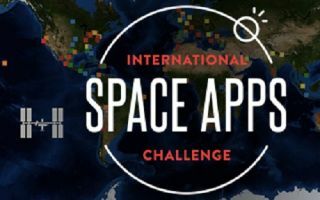 As part of the second-ever International Space Apps Challenge, NASA has released 50 wide-ranging problems to be tackled during the 48-hour event. You can still register as a virtual participant or sign up to take part in an event in one of the dozens of participating cities. Organizers say the challenge isn't just for engineers and coders; artists, designers, scientists and students are welcome, too. Local prizes will be given out at the end of the hackathon for the best solutions to come out of each official Space Apps event. Then an international judging panel will select a "best in class" winner for each of the following four categories: best use of data; best use of hardware; most inspiring; and biggest galactic impact (or most likely to improve life on Earth or in space.) There will also be an online public poll, and the project that gets the most votes will win the People's Choice award. The winners will be announced on May 22. Spot the Station: Extend the functionality of the Spot the Station website (spotthestation.nasa.gov) that allows you to share your sightings of the International Space Station with others. Hitch a Ride to Mars: Design a CubeSat (a small research satellite) for an upcoming Mars mission. 3-D Printing Challenge: Create an open source model of space hardware that can be generated by a 3-D printer. Curiosity at Home: Foster a connection between citizens and the Mars rover through software, visualizations, or an app. Seven Minutes of Science: Develop a concept to make use of 330 pounds (150 kilograms) of ejectable mass during the entry and landing phase of a Mars mission to accomplish scientific or technical objectives. Catch a Meteor: Create an app that would allow observers of a meteor shower to trace the location, color and size of the meteor. Smart Cities, Smart Climate: Explore the impacts of atmospheric changes on the health, infrastructure and society in urban areas. Why We Explore Space: Share the "why" of space exploration through the creation of compelling narratives and visualizations.